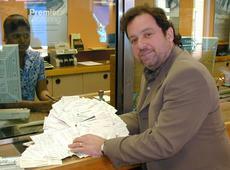 In a major step forward for CAST.IRON, Tim Phillips paid in hundreds of cheques at the Burleigh Street/Fitzroy Street (Cambridge) branch of the Cooperative Bank on Monday 29th September 2003 at 12 Noon. The cheques are the result of distributing thousands of leaflets to households and businesses along the line and within five miles of it. The leaflet explains the CAST.IRON plans for reinstating rail services to the line in stages, using a combination of private finance and volunteer work. According to Tim, this is a new way of enabling popular schemes to go ahead when the usual sources of financing show no interest. "We have received almost 100% support - and thousands of pounds - for the return of rail services. The leafletting has provided an opportunity to challenge our scheme but so far, we have received just five serious objections...and at least two of them melted away when the scheme was explained in more detail. CAST.IRON means no NIMBYs! ", said Tim. "We've all heard of Private Finance Initiatives - PFIs - and Private-Public Partnerships - PPPs - but now you ladies and gentlemen of the press are going to have to get used to the V-word...Volunteers. We have dozens of professionals queueing up for 41 CAST.IRON jobs even though they are unpaid; from barristers to gardeners, from marketing consultants to track-layers, from civil engineers to builders. There's even a suggestion that qualified train drivers will work for us for nothing, at least to start with. As Britains First Community Commuter Railway, we will pioneer a new concept - a PVP or Private-Volunteer Partnership. Better still, we are hoping to divert Government funds away from the rival guided bus scheme, so look out for possibly the world's first PPVP!" Cambridge Labour MP Anne Campbell met with Tim and a senior rail company director [on Wednesday 24th September] to discuss ways of restoring rail services at a much lower cost than via conventional channels. Reopening lines usually means a complicated round of legal and safety approvals but these can be all but eliminated by coming 'under the wing' of an existing operator. The new buzz-word is 'Microfranchise' where the local population provides relatively modest funds but significant amounts of professional and manual skills to enable the safe resumption of rail services to main line standard. "I think Mrs Campbell understands that when it comes to local rail financing, there is indeed a 'Third Way' - a consensus between the people, the politicians and the businesses to pave the way for providing what the people want at a price everyone can afford", says Tim. "This is not anorak stuff, this is the real thing". "The cheques we are paying in today have already paid for our initial leaflet campaign and all the administrative costs to get us where we are. With money in the bank and hundreds of pounds coming in each day, we can start work on all the jobs that will enable us to present the case - the CAST.IRON case - for rail between Cambridge, St Ives and Huntingdon". We are grateful to the Cooperative bank for allowing photography within the bank.